Blue Origin, private spaceflight company backed by e-commerce retail billionaire Jeff Bezos, has entered into a partnership with a Boeing-Lockheed Martin joint venture to supply rocket engines that will launch America's military and national security satellites. The announcement comes after fellow billionaire Elon Musk revealed developments behind building a rocket and capsule through his Space Exploration Technologies business. The partnership between United Launch Alliance and Blue Origin has set a four-year advancement plan, with full testing that will commence in 2016, and the first flight scheduled for 2019, as indicated by the official statement today from both the companies. The Boeing-Lockheed joint venture currently handles all US military satellite launches. Competition has been turned intense in recent years as the availability of Russian-made RD-180 engines normally utilized in US space launches is continuously threatened by political strains over Russia’s conflict with Ukraine. "It's time for a 21st Century booster engine," Bezos, the founder of retailer Amazon.com, said at a news conference on Wednesday in Washington. The engine will be 100 per cent built and tested in the United States, he said. 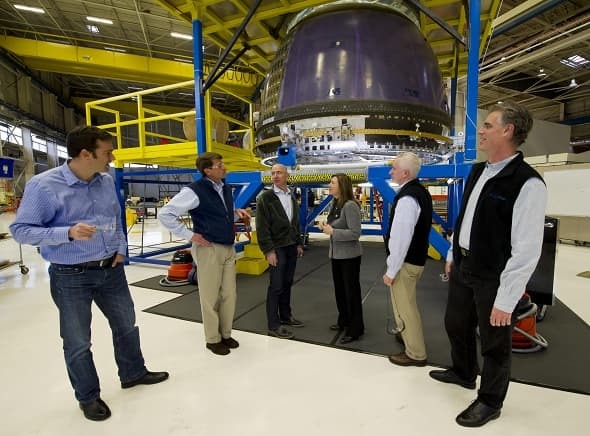 Blue Origin's BE-4 engine has been under development for past three years, and is high-performing while being minimal when it comes to cost, Bezos said. Competition is fierce in comparison to actually launching satellites. The National Aeronautics and Space Administration on Tuesday said Boeing and SpaceX would divide $6.8 billion in government financing to build the first US manned craft since NASA resigned the shuttle fleet in 2011. In 2017, the Boeing-SpaceX manned craft would supplant NASA's sole utilization of Russia's Soyuz rockets to get individuals to the station, a plan that costs about $70 million a seat. United Launch Alliance utilizes RD-180 engine in some of its Atlas V rockets flights. US reliance on a Russian-made engine has provoked criticism in Congress since Russia annexed Ukraine's Crimea region not long ago. The US and the European Union have forced financial sanctions on Russia trying to get President Vladimir Putin to back up. Russian Deputy Prime Minister Dmitry Rogozin said in May that his nation would cut off the supply of the engines to the US in countering for the diplomatic pressures. In April, he sent out a tweet suggesting via Twitter that the US should consider sending crews to space "with a trampoline." The NASA contract to carry astronauts to the International Space Station will pay a sum of up to $4.2 billion to Boeing and $2.6 billion to SpaceX. Boeing and SpaceX might accomplish six missions as a part of the Commercial Crew Transportation Capability contract, NASA said. NASA said on Tuesday it will keep on meeting expectations with Blue Origin and an alternate spaceflight company, Sierra Nevada, as they refine shuttle designs. Boeing was a significant partner in NASA's Apollo and shuttle programs, and the United Launch Alliance has an exclusive contract to carry US military payloads. A month ago, the US Air Force issued a ‘’request for information’’ from industry on potential choices to replace the RD-180 engine. Until further notice, Russian and American space explorers will keep on training together for Soyuz missions in the midst of strained ties between the two nations. US space travelers are slated to launch for the space station in Russian launch vehicles on September 25 and November 23, as indicated by a schedule posted on NASA's site.